To study pain perception in 10–15-year-olds, during and after uncomplicated extractions of bilateral maxillary premolars. The study investigated pain’s natural course and made comparisons between the first and second extractions. 31 Swedish children in need of orthodontic treatment were identified and consecutively enrolled. Tooth extractions followed a standardised protocol and the two teeth were extracted with at least 10 days between. The participants rated pain intensity using visual analogue scale (VAS) at 14 different time points from treatment and 7 days forward. The pain intensity profile followed the same pattern for all patients. 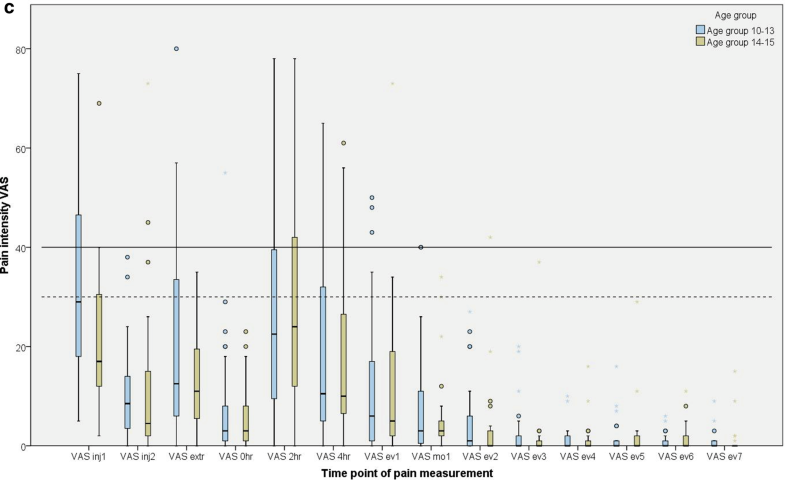 Pain intensity peaked 2 h after extractions (mean VASPI 27.3, SD 20.8; median 23.0) when moderate pain intensity (VASPI ≥ 40) was registered for 16 (28%) of 57 cases. After that, there was a rapid decrease in pain intensity notable already at 4 h after extractions. 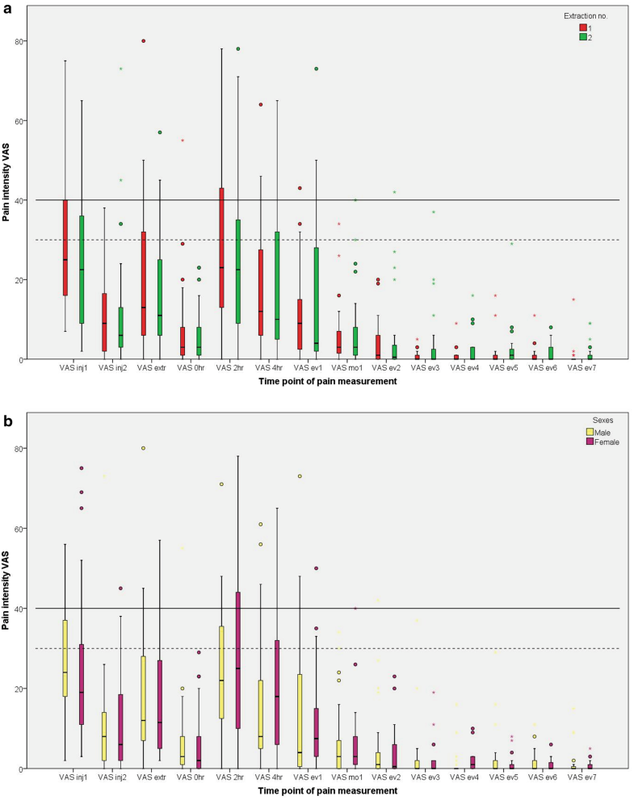 There were no statistically significant differences in any VASPI measurements between the first and second extractions, sexes, or different age groups. The majority of the participants who undergo uncomplicated bilateral extraction of maxillary premolars experience mild to moderate levels of postoperative pain during a short period of time, with no differences between the first and second extractions. Bilateral tooth extractions is a suitable model for further studies on pain management. Although extraction is one of the most frequently performed oral surgical therapies (Al-Khateeb and Alnahar 2008; Ghanei et al. 2018), knowledge about natural course of pain perception during and after tooth extraction in children and adolescents is sparse. Post-extraction pain was investigated in an observational study on 221 children, 2−7 years of age (Acs et al. 1986). Of these, 38% reported pain experience via a questionnaire that the parents filled out (proxy assessment) at home and returned to the dentist. Pain level was recorded as mild, moderate, or severe. The study did not report the actual time of pain measurement, number of pain recordings, type of tooth extracted, or reasons for extraction. Another study (Ashkenazi et al. 2007), on 2−15-year-old children, described pain after extraction in 43% of the 84 participants. In a telephone interview, usually with the parents, one question to assess pain between 8 and 24 h after extractions was asked. No other details of any pain assessments were reported; the children had received various pharmacological as well as behaviour management approaches, including sedation with midazolam and inhalation of nitrous-oxide/oxygen during treatment. Both of the above studies have several methodological issues. First, the patient material spanned a wide age range, both primary and permanent teeth were included, and diagnoses and reasons for extractions or number of extractions were not described. However, it is reasonable to believe that one common reason for extraction would be teeth with some form of pathology related to it. Second, pain-measuring methods were insufficiently described; the criteria were not defined, and parental reports were the main source of information. Parental and other proxy reports are problematic: pain is a subjective experience (IASP 2014) and basing measurements on the patient’s understanding and perception of pain is preferable. Pain not only harms the patient, but is also an important concomitant factor in the development of dental fear and anxiety (DFA) and behaviour management problems in children and adolescents (Klingberg and Broberg 2007); thus, prevention of pain is important. Today, use of local anaesthetics is well established and regarded as a safe and effective way to minimize pain during treatment (Klingberg et al. 2017). In addition, use of general analgesics, such as oral administration of paracetamol (acetaminophen) to minimize the risk of pain in conjunction with dental treatments such as tooth extractions has been proposed. An updated Cochrane-review from 2016 on preoperative administration of analgesics concluded that there was not enough scientific evidence to determine whether analgesics taken before treatment were effective for reducing pain after dental treatment under local anaesthetic in children and adolescents. They also concluded that more well-designed studies are needed (Ashley et al. 2016). No systematic review on postoperative administration of analgesics for preventing/reducing postoperative pain has been identified. Despite the lack of scientific support, there are reports of dentists using oral analgesics to reduce pain in conjunction with extractions and filling therapy (Berlin et al. 2018). Thus, there is a need for well-designed clinical studies to evaluate the effect of oral analgesics to prevent pain, and based on this to formulate clinical guidelines. Before doing these studies there are still some methodologic issues to consider. Two questions need answers: (1) what does pain’s natural course, using standardised measures made by children, look like after tooth extractions and, (2) if repeated extractions—will this affect the perceived pain intensity? The latter question is important as future studies probably would be randomized controlled trials using two arms with either two different pharmacologic agents or dosages, or two arms where one is an active drug and the other placebo. It cannot be disregarded that repeated experiences of tooth extraction may affect pain perception: that the child understands and accepts pain differently if the treatment is replicated. Health economics is important for the development of clinical guidelines. As decisions may be guided by interventions’ cost-effectiveness, it is important to know not only the effects but also the societal cost related to all interventions. Because simple or uncomplicated tooth extractions, especially extractions for orthodontic reasons, can be standardised, this treatment may serve as a model for studying pain and pain intensity. The present study aims to investigate pain intensity in 10−15-year-olds during and after uncomplicated tooth extractions—orthodontically indicated and standardised bilateral extractions of maxillary premolars—to understand the natural course of pain and to make comparisons between the first and second extractions. Children and adolescents experience pain (defined as VASPI ≥ 40) after tooth extraction. The first extraction is as painful as the second. Eligible participants were identified and consecutively enrolled in the study during their first visit for orthodontic treatment in Malmö, Sweden. Inclusion criteria were good general health, age 10 to 15 years, and requiring extraction of two permanent maxillary premolars (bilateral) before orthodontic treatment. Based on the radiographs, the extractions were expected to be uncomplicated. If the patients needed extractions of mandibular premolars, these were done after the study. Extractions in the maxilla were chosen as they are easier to standardise because of both root anatomy and buccal and palatal infiltration for local anaesthetics. In the mandible, infiltration technique is not always sufficient and if inferior alveolar nerve block is required, the additional numbness of the tongue and lower lip may be interpreted as uncomfortable and could affect the VASPI measurement. Exclusion criteria were the patient needing conscious sedation to manage the extractions, and the patient or legal guardian being unable to understand Swedish. After verbal and written information, the legal guardian signed an informed consent form. All children received age-appropriate information and assented to participate. The Regional Ethics Review Board in Lund, Sweden (#2014/527) approved the study. At the first visit, patients received brief information about the treatment procedure. Which tooth to extract first (on the left or right side) was randomly chosen in a coin toss. A detailed treatment protocol describing all parts of the treatment including amount of and timing of topical and local anaesthetics was constructed and followed for all extractions. Topical local anaesthetic (lidocaine gel 5%, APL, Sweden) was placed for 2 min both buccal and palatal to the tooth to be extracted (Bhalla et al. 2009). The total amount of topical anaesthetic used was equivalent to the size of a pea (approx. 0.4 g). After that, buccal and palatal injection with 1 cartridge (= 1.8 ml) of room-tempered local anaesthetics (LA), Xylocain Dental Adrenalin (lidocaine hydrochloride 20 mg/ ml, adrenaline 12.5 µg/ ml; Dentsply Pharmaceutical, Weybridge, Surrey, UK) was administered using a 30-gauge (21-mm long) needle. A stopwatch was used to standardise the length of the injections to 2 min (Maragakis and Musselman 1996). 2 min after injection, the level of anaesthesia was controlled using an explorer, penetrating the gingiva around the tooth to be extracted. When anaesthesia was inadequate, additional LA was injected. The clinician extracted the tooth using an elevator and forceps and a gentle, standardised technique. No suggestions or prescriptions were given regarding postoperative analgesics. The second visit followed the same treatment procedure as the first visit. All patients, except for two, were treated by the same operator (HB). The other two were treated by one of the other authors (KR). The operators were calibrated by information and discussions about the treatment protocol before performing the tooth extractions. At various time points during and after treatment, the patient recorded pain intensity on a 100-mm visual analogue scale (VAS) with the endpoints no pain at all and worst possible pain (Table 1). VAS is a unidimensional scale for estimating patients’ perceptions of pain intensity (Huskisson 1974). Patients would place a mark on the VAS at the point representing their perceived pain intensity (VASPI). Later, measurements with a ruler converted the marks to numerical values. We chose VASPI ≥ 40 to define clinically relevant pain in the present study. A second threshold was defined as VASPI ≥ 30—to mirror lower levels of moderate pain (Jensen et al. 2003; van Dijk et al. 2002). Before treatment, patients were given instruction on how to use the VAS. After treatment, they received an envelope with a number of blank VAS and were instructed to fill them out at specific points of time. The time points are presented in Table 1. The evening after treatment, the dentist telephoned the patients to remind them about the VAS. Before each visit, participants received a questionnaire with the Children’s Fear Survey Schedule-Dental Subscale (CFSS-DS) (Cuthbert and Melamed 1982) to measure dental fear and anxiety (DFA). This was addressed to ensure that anxiety would not influence the perceived pain intensity. The CFSS-DS is the most frequently used measure of DFA in children and adolescents (Klingberg and Broberg 2007) and comprises 15 items scored on a Likert-type scale ranging from 1 (not afraid at all) to 5 (very afraid). The total score ranges between 15 and 75; 38 and above is considered to represent DFA (Klingberg 1994). The children were instructed to fill out the CFSS-DS by themselves and bring it to the dental appointments. The patients and their parents or legal guardians were also asked about the time at school or work that had been missed due to the procedure and the related pain, expenditures linked to the dental appointments, and whether the patient’s schoolwork had been affected. Treatment length and numbers of follow-up visits and contacts with the dental clinic in the 7 days after extractions were also queried. All costs were calculated in Swedish Crowns (SEK) and then converted into Euros (€). Mean exchange rate in 2016 was €1.00 = 9.63 SEK [Sveriges Riksbank (Sweden’s central bank)]. Data were compiled and analysed using SPSS version 24.0 (IBM Corp. Released 2016. IBM SPSS Statistics for Windows, version 24.0. Armonk, NY: IBM Corp). The independent samples t test analysed differences between groups such as age, sexes, and time of day of the treatment. Paired samples t test was used for comparing treatment time between the first and second extractions. The t tests was used since the data being analysed were judged to be parametric data. The Wilcoxon signed-rank test was used to analyse differences between VASPI at the first and second extractions, and the Mann–Whitney U test for differences in VASPI between groups at the first and second extractions. A significance level of p < 0.05 was chosen. 34 children were initially invited. Three were excluded: one because placement of orthodontic brackets was planned for the day after the first extraction; one, because orthodontic treatment had already begun; and one, who did not understand the VAS. Thus, 31 patients were included and divided into two age groups: 10–13-year-olds, and 14–15-year-olds (Table 2). Thus, 62 extractions were performed, but the number of valid VASPI registrations made at home or at school, were lower owing to patients failing to return registrations, VAS not correctly filled out, or excluded when patients had self-administered oral analgesics. Only one individual reported a CFSS-DS score ≥ 38 (40, representing DFA) before the first extraction, and none before the second. There were no statistically significant differences in mean CFSS-DS scores before the first and second extractions, between sexes or age groups, and there was no relationship between CFSS-DS scores and VASPI. No additional analyses were made regarding the CFSS-DS scores since DFA did not have any impact on pain intensity. Extraction began on the right side in 20 cases (64.5%); 44 of the 62 extracted teeth were permanent maxillary first premolars; the remaining were permanent maxillary second premolars. The mean time between the first and second extractions was 15 days (range 11–33 days). Mean treatment time, from application of topical anaesthetic to finished extraction of the tooth, was 13.2 min (range 8–22) for the first extraction, and 12.6 min (range 8–19) for the second extraction (p = 0.327, paired-samples t test). 36 of the extractions were done in the morning. 2 h after treatment, VASPI2hr did not differ statistically significantly between extractions performed before or after noon. 13 of 29 participants (44.8%; 6 boys and 7 girls) reported previous experience of LA before entering the present study. No statistically significant differences in pain intensity during injection, extraction, or 2 h after treatment occurred between patients with and without previous experience of LA. At the first extraction, nine patients reported insufficient anaesthesia after the injection of one capsule LA, and at the second extraction, seven patients. These patients (12 in all) received another 0.5 to 1.5 capsules of LA before extraction. VASPI scores at 2 h after treatment did not differ statistically significantly between patients receiving one capsule of LA and those who received more (Table 3). Patients reported higher VASPI scores during injection (VASPIinj1) than during extractions (VASPIextr) (Fig. 1). There were no differences in VAS scores between the first and second appointments (VASPIinj1, VASPIinj2, VASPIextr, VASPI0hr, VASPI2hr and VASPI4hr) (Table 4). Postoperative pain ratings followed the same course for all patients (Figs. 1, 2a–c), with no statistically significant differences between the first and second extractions, between boys and girls, or between age groups (Tables 3, 4). Pain intensity peaked 2 h after treatment at a mean VASPI for all extractions of 27.3 (SD 20.8; median 23.0) and then decreased to a mean of 18.3 (SD 17.9; median 10.0) at 4 h after treatment. At VASPI2hr, 16 of 57 extractions resulted in pain (VASPI ≥ 40). This level of pain intensity remained in 6 of 53 cases at VASPI4hr. The corresponding numbers for VASPI ≥ 30 were 24 of 57 extractions at VASPI2hr and 13 of 53 at VASPI4hr. Eight patients took oral analgesics after the first extraction and six of these did so after the second on their own initiative. Table 5 shows the VASPI scores of these patients made before their intake of oral analgesics. Any scores made after medication were excluded from the statistical analyses. Pain intensity did not differ at any time between patients who took oral analgesics and those who did not. Time spent for both extractions showed that parents (and/or legal guardians) spent a mean time of 3.6 h (SD 1.4; median 4.0) for accompanying their children to the two dental treatments. The majority of the participants came to the dental clinic by car, but since all treatments within this study, were performed at the university clinic, (a clinic different from their normal dental clinic), the expenditures for their travel was difficult to calculate. Children missed a mean time of 6.1 h (SD 4.4; median 4.0) of school. None of the participants sought additional dental treatment for complications after the extractions. Seven children (4 girls and 3 boys) did not return to school after tooth extraction. No detailed data for reason or if they stayed at home after one or both treatments is available. In the present study, the majority of the patients who underwent uncomplicated bilateral extractions of maxillary premolars experienced mild to moderate levels of postoperative pain. Pain intensity peaked 2 h after tooth extraction, and had declined radically 4 h after extractions. Thus, pain was perceived for a short period of time. There were no differences in pain intensity profiles between the first and second extractions. Nor were there any differences between sexes, or between younger and older patients. Thus, postoperative pain after uncomplicated bilateral extractions of maxillary premolars due to orthodontic indications follows a steady pain intensity profile. As this treatment is relatively common, easy to standardise, and reproducible, we suggest this model as robust and suitable for studies on treatment of in young patients. Pain studies on children and adolescents can raise ethical issues, why these studies should primarily be done on adult patients. In the present study, however, the natural course of pain during and after a standard procedure that general dental practitioners perform on a daily basis, was studied. We chose this treatment since it is potentially painful but, according to the literature, not associated with a high frequency of any other problems. The patients and their parents were informed verbally and in writing that they could withdraw from the study whenever they liked. They also had access to the research group throughout the study, if needed. Parents and guardians signed informed-consent forms before a participant was allowed to enter the study, and the children received age appropriate information and assented. This study also received ethical approval. Pain intensity peaked 2 h after treatment in the present study which is concordant with a study from 2013 (Mustafa et al. 2013). It is plausible to speculate that this peak coincides with the time when the anaesthesia wears off. Duration of anaesthesia when using Lidocaine 2% (with 1:50,000 to 1:100,000 epinephrine) in the pulp is about 60 min after infiltration injection and in soft tissue, about 170 min (Becker and Reed 2006). The duration of Lidocaine 2% differs from one individual to another; well illustrated in a study from 2016 (Elbay et al. 2016) who reported a variation in duration of LA after inferior alveolar blocks from 111 to 285 min (mean 149 min). Thus, measurement of pain intensity after both 2 and 4 h appears adequate and crucial, especially when infiltration technique, and not inferior alveolar nerve block, is used. The prevalence of postoperative pain after tooth extraction varies among studies. While 28% (16 of 57) of the extractions in the present study led to moderate postoperative pain (VASPI ≥ 40), other studies report from around 30% up to 85% postoperative pain (Acs et al. 1986; Ashkenazi et al. 2007; McGaw et al. 1987; Moore et al. 1985). Factors related to study design may explain the differences; for example, number of participants, age distribution, reasons for extraction, extraction technique, tooth extracted (in maxilla or mandible), and pain measurement method. An important finding in the present study was that pain intensity did not differ between the first and second extractions, why there is no reason to assume any conditioning effect when repeating the treatment, i.e. the tooth extraction. This has not been studied before. This supports a future randomized controlled trial based on split mouth design using bilateral extractions of maxillary premolars as a model to investigate the effect of different pharmacologic agents, dosages or placebo in two arms. It is unlikely that there will be any conditioning effect provided a proper sample size calculation precedes the study. The present study used a standardised protocol with uncomplicated bilateral extractions in the maxilla. This treatment is easy to reproduce, the anatomy of the roots are rather uncomplicated on upper premolars, easily accessible, and the trauma to the bone tissue is limited. Teeth extracted on orthodontic indications are in general healthy and free from inflammatory response in the pulp, which could affect the sensation of pain negatively. Administration of local anaesthetics in the maxilla is also less operator sensitive than administration of inferior alveolar nerve block. The present study included a homogeneous group of patients regarding age as well as reason for extractions, and one operator carried out the majority of all treatments. The study used a self-reported and patient-centred outcome, which is preferred due to the subjective nature of pain (American Academy of Pediatrics. Committee on Psychosocial Aspects of Child and Family Health, Task Force on Pain in Infants, Children, and Adolescents 2001). Further, pain intensity was measured several times over a 7-day period, enabling an understanding of the natural course of pain. These are strengths of the present study. Previous data on sample size calculation applicable to this study could not be found. In two previous studies (Acs et al. 1986; Ashkenazi et al. 2007), they had 221 and 84 participants, respectively, who underwent dental extractions (tooth type and reason for extraction not explained). On the other hand, a study (Hariharan et al. 2014) included only 27 patients in a split-mouth designed evaluation of pain after use of two different forceps during extraction of upper premolars prior to orthodontic treatment. In the light of this, the number of participants in present study is adequate. Use of the VAS as a pain rating scale for the age group in the present study could be discussed. At some ages, translating pain experiences to a rating tool can be difficult for children, even though they are capable of expressing their pain in words. When children are over the age of 7, various types of scales for self-assessment can be used. Between 7 and 10 years, the literature has advocated face scales, and from the age of 10, numerical rating scales (NRS) and VAS (Norrbrink and Lundeberg 2012; Shields et al. 2003). To ensure comprehension of the VAS in the present study, the participants received thorough information and instruction about the instrument before each extraction. Cut-off values are always troublesome, especially when dealing with something such as pain, which by definition is subjective (IASP 2014). A fixed cut-off point on the VAS is not relevant due to inter-individual variations in pain expression (van Dijk et al. 2002). A person who scores 45 on the VAS might still not think it is painful, while another might perceive a score of 24 as very painful. Still, there is a need for researchers and clinicians to have some kind of grid or ruler to develop methods for intervening in and preventing pain. To date, no cut-off for postoperative clinical pain requiring pain management in children has been defined. For postoperative pain, some studies have suggested, arbitrarily, VASPI 30 as cut-off for mild to moderate pain (Berde et al. 1991; Breivik et al. 2008; Mustafa et al. 2013; Taddio et al. 2009; van Dijk et al. 2002). 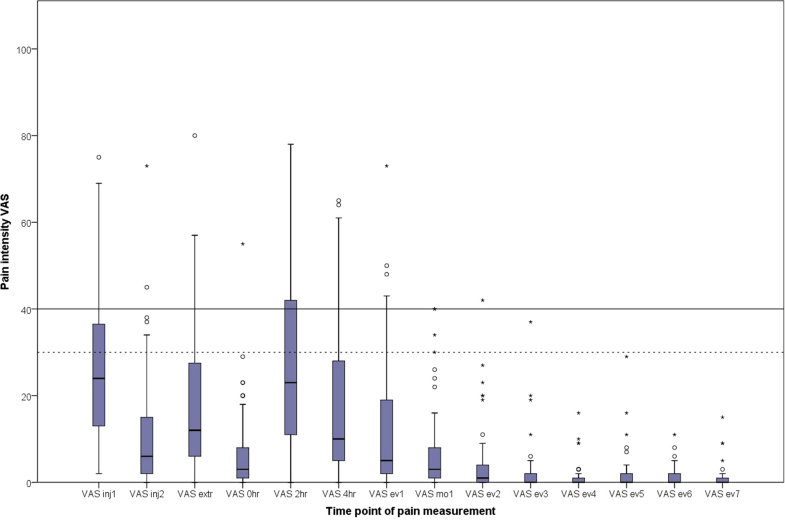 VASPI 40 and 44 have been used as thresholds for moderate pain or need for pain management (Jensen et al. 2003; van Dijk et al. 2002). In this study, VASPI ≥ 40 succeeded in identifying moderate pain 2 h postoperatively in 16 of 57 extractions. A VASPI ≥ 30, however, would identify 26 of 57 scores 2 h after extraction as mild to moderately painful; this is a higher number, even though lower in intensity. More importantly, the same pattern of a short peak in pain intensity followed by a rapid decrease could be seen. This is important as it puts light on a short window of pain that has to be managed in some way. One strategy, possibly often overlooked, is information about expected level and the duration of pain and discomfort after the extraction. The finding of a pain profile in this study is thus important as it enables dental health professionals to provide patients with more accurate information about the expected course of pain after an extraction. Use of pharmacological agents such as oral analgesics is another potential strategy. Still there are some questions. If analgesics were to be used, what would be the best way to administer them? A recently updated systematic review of the effect of preoperative analgesics for additional pain relief in dental treatment of children (Ashley et al. 2016) identified and evaluated five trials. The researchers concluded that it was not possible to determine whether preoperative analgesics were of benefit in paediatric dentistry for procedures under local anaesthesia, and the authors called for further randomized clinical trials. Based on the pain ratings in this study, and the pain profiles derived from the VASPI ratings of the participants, would a single dose analgesics after treatment be a good alternative? The benefits with this model would be that the onset of the drug would be nearer the pain peak. However, this must be studied further. 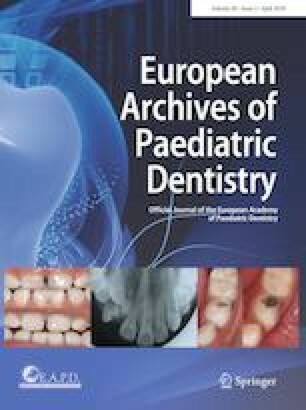 To our knowledge, no systematic review on postoperative administration of analgesics in paediatric dentistry has been published. Thus, there is hardly any evidence for analgesic use, pre- or postoperatively, to reduce pain after uncomplicated dental treatment in children; this remains a knowledge gap. Based on this, and the fact that all administration of pharmacologic agents comes with a risk (Matok et al. 2016; Norman et al. 2014), it can be questioned if there is any reason for clinical guidelines in this area. Analogously, there is no rationale for introducing or routinely using administration of analgesics in conjunction with routine dental treatments such as filling therapies or uncomplicated extractions (Berlin et al. 2018). When considering use of pharmacological agents with children, there must be a clear-cut reason for doing so. Otherwise, development of general guidelines would be unethical and contraindicated. Instead, the relatively mild pain intensity and short duration of pain indicates that medication should be individually tailored and not a general recommendation. Another important aspect when making general recommendations is health economics. In this study, the cost of the dental treatment could be mirrored by the Swedish so-called reference price. For an uncomplicated tooth extraction, the reference price was €104.3 [Tandvårds- och läkemedelsförmånsverket (The Dental and Pharmaceutical Benefits Agency)] and this is assumed to mirror the total cost in the dental clinic. Other costs are related to travelling (which could not be calculated), and the indirect cost for productivity loss related to the parents’ absence from work. The average wage (year) for individuals aged 40–49, which may be assumed to be parents of children aged 10–15 years, is €40,137 [Statistiska centralbyrån (Statistics Sweden)] and when the social fees are added (35%) the value is €54,185. Based on number of work hours for 2016 [Arbetstimmar per månad (work hours per month)], the hourly production value would be €26.77. Since the parents were away 3.6 h in mean, during the study period, the indirect cost for productivity loss would be €96.4. Adding the cost for the two extractions results in €305.0. This may be considered a low cost for this treatment, especially when comparing the cost for the orthodontic treatment, following (Petrén et al. 2011; Ganzer et al. 2018). In the present study, no side effects, requiring additional treatment were reported. Tooth extraction is a standard procedure and on the right indications, €305.0 has to be considered a reasonable cost and hence, this is a cost-effective procedure. In conclusion, uncomplicated extractions of premolars caused moderate postoperative pain (VASPI ≥ 40) in 16 (28%) of 57 extractions in young patients. There were no differences in the natural course of pain between first and second extractions, younger and older patients, or between sexes. The pain peaked 2 h after extraction, around the time where LA wears off. After that, there was a rapid decrease in pain intensity notable already at 4 h after extractions. As the pain intensity profiles for both extractions were similar to each other, it is suggested that bilateral extractions of maxillary premolars is a suitable model for studies on pain management. The study was supported by grants from the Swedish Dental Society, the Swedish Society of Paediatric Dentistry; the Faculty of Odontology, Malmö University; Skåne Regional Council, Sweden; and the American Dental Society of Sweden. HB and GK conceived the ideas; HB collected the data; HB, GK, TL, TD, KR, and DT analysed the data; HB and GK led the writing; and all authors participated in finalizing the manuscript. Arbetstimmar per månad. [Work hours per month]. http://www.arbetstimmarpermanad.se/. Accessed September 2018. IASP. International Association for the Study of Pain. 2014. http://www.iasp-pain.org/Taxonomy. Accessed September 2016. Statistiska centralbyrån (SCB) [Statistics Sweden]. 2018. http://www.scb.se/. Accessed Sep 2018. Sveriges Riksbank [Sweden’s central bank]. 2018. https://www.riksbank.se/sv/statistik/sok-rantor--valutakurser/?g130-SEKEURPMI=on&from=2018-08-21&to=2018-09-21&f=Year&c=cAverage&s=Comma. Accessed Sep 2018. Tandvårds- och läkemedelsförmånsverket [The Dental and Pharmaceutical Benefits Agency]. 2018. https://www.tlv.se/tandvard/referensprislista.html. Accessed Sep 2018.